It looks like a regular roof, but the top of the Packard Electrical Engineering Building at Stanford University has been the setting of many milestones in the development of an innovative cooling technology that could someday be part of our everyday lives. Since 2013, Shanhui Fan, professor of electrical engineering, and his students and research associates have employed this roof as a testbed for a high-tech mirror-like optical surface that could be the future of lower-energy air conditioning and refrigeration. Research published in 2014 first showed the cooling capabilities of the optical surface on its own. Now, Fan and former research associates Aaswath Raman and Eli Goldstein, have shown that a system involving these surfaces can cool flowing water to a temperature below that of the surrounding air. The entire cooling process is done without electricity. "This research builds on our previous work with radiative sky cooling but takes it to the next level. It provides for the first time a high-fidelity technology demonstration of how you can use radiative sky cooling to passively cool a fluid and, in doing so, connect it with cooling systems to save electricity," said Raman, who is co-lead author of the paper detailing this research, published in Nature Energy Sept. 4. Together, Fan, Goldstein and Raman have founded the company SkyCool Systems, which is working on further testing and commercializing this technology. Radiative sky cooling is a natural process that everyone and everything does, resulting from the moments of molecules releasing heat. You can witness it for yourself in the heat that comes off a road as it cools after sunset. This phenomenon is particularly noticeable on a cloudless night because, without clouds, the heat we and everything around us radiates can more easily make it through Earth's atmosphere, all the way to the vast, cold reaches of space. "If you have something that is very cold – like space – and you can dissipate heat into it, then you can do cooling without any electricity or work. The heat just flows," explained Fan, who is senior author of the paper. "For this reason, the amount of heat flow off the Earth that goes to the universe is enormous." Although our own bodies release heat through radiative cooling to both the sky and our surroundings, we all know that on a hot, sunny day, radiative sky cooling isn't going to live up to its name. This is because the sunlight will warm you more than radiative sky cooling will cool you. To overcome this problem, the team's surface uses a multilayer optical film that reflects about 97 percent of the sunlight while simultaneously being able to emit the surface's thermal energy through the atmosphere. Without heat from sunlight, the radiative sky cooling effect can enable cooling below the air temperature even on a sunny day. "With this technology, we're no longer limited by what the air temperature is, we're limited by something much colder: the sky and space," said Goldstein, co-lead author of the paper. The experiments published in 2014 were performed using small wafers of a multilayer optical surface, about 8 inches in diameter, and only showed how the surface itself cooled. Naturally, the next step was to scale up the technology and see how it works as part of a larger cooling system. 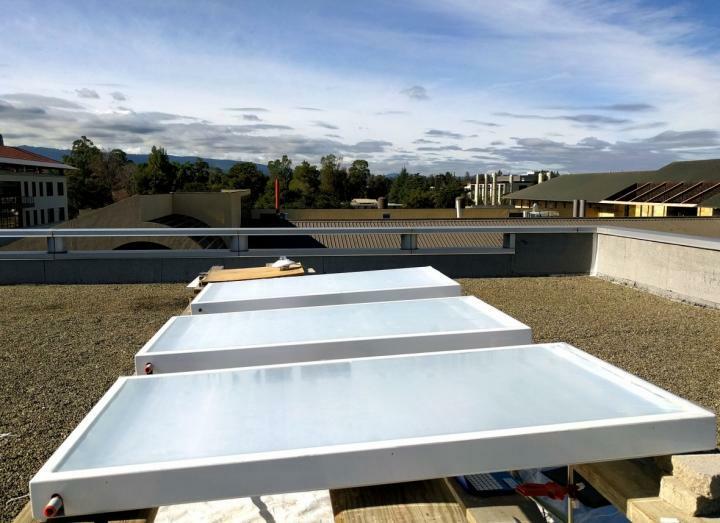 For their latest paper, the researchers created a system where panels covered in the specialized optical surfaces sat atop pipes of running water and tested it on the roof of the Packard Building in September 2015. These panels were slightly more than 2 feet in length on each side and the researchers ran as many as four at a time. With the water moving at a relatively fast rate, they found the panels were able to consistently reduce the temperature of the water 3 to 5 degrees Celsius below ambient air temperature over a period of three days. The researchers also applied data from this experiment to a simulation where their panels covered the roof of a two-story commercial office building in Las Vegas – a hot, dry location where their panels would work best – and contributed to its cooling system. They calculated how much electricity they could save if, in place of a conventional air-cooled chiller, they used vapor-compression system with a condenser cooled by their panels. They found that, in the summer months, the panel-cooled system would save 14.3 megawatt-hours of electricity, a 21 percent reduction in the electricity used to cool the building. Over the entire period, the daily electricity savings fluctuated from 18 percent to 50 percent. Right now, SkyCool Systems is measuring the energy saved when panels are integrated with traditional air conditioning and refrigeration systems at a test facility, and Fan, Goldstein and Raman are optimistic that this technology will find broad applicability in the years to come. The researchers are focused on making their panels integrate easily with standard air conditioning and refrigeration systems and they are particularly excited at the prospect of applying their technology to the serious task of cooling data centers. Fan has also carried out research on various other aspects of radiative cooling technology. He and Raman have applied the concept of radiative sky cooling to the creation of an efficiency-boosting coating for solar cells. With Yi Cui, a professor of materials science and engineering at Stanford and of photon science at SLAC National Accelerator Laboratory, Fan developed a cooling fabric. "It's very intriguing to think about the universe as such an immense resource for cooling and all the many interesting, creative ideas that one could come up with to take advantage of this," he said. This work was funded by the Advanced Research Projects Agency – Energy (ARPA-E) of the Department of Energy.